Finding family friendly fall activities is on everyone’s mind as the seasons change. The fall air is crisper. The leaves begin to change color and apple cider appears in the produce section of the commissary. With many holidays and long weekends in the fall, we want to make the most of our family time together. Halloween is often too scary for younger children. Even toned down ghosts and witches can be the stuff of nightmares for little ones. Perhaps your family feels personal convictions about celebrating Halloween at all. That doesn’t have to take the fun out of Fall. 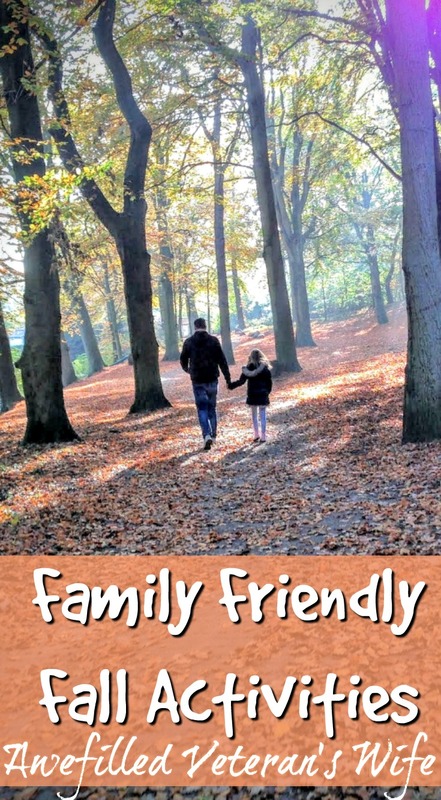 What are some family friendly fall activities that military families can enjoy? Decorate your house together. Living on post often means lots of competition on the homemaking front. Even if you choose not to decorate for Halloween, you can find many fall-themed decorations to give your front porch personality. Your local Hobby Lobby has hay bales and fall themed items. 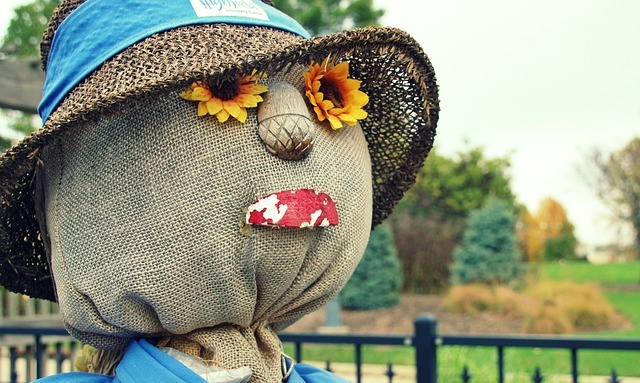 If you’re a craftier person, making homemade scarecrows using old broom handles or wooden dowel rods and cast-off clothes is a great way for everyone to participate. Let the kids choose some old clothes, stuff him with hay, and paint his face. Painting pumpkins is another fun family activity that can be used for decor inside or out. 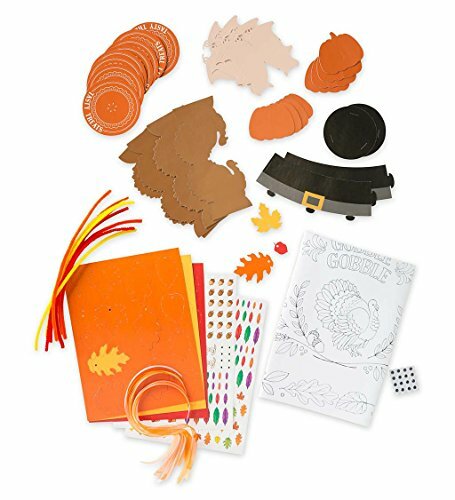 If your children love being crafty check out this Crafty Creations Kids’ Tables Kit. It comes with tablecloths to decorate and little table crafts to make for both fall/Thanksgiving and Christmas. It has trees on which to write down reasons to give thanks which is a great way to focus on the meaning behind our thankfulness and Christmas celebrations! These groups are Protestant/Catholic Women of the Chapel. Most military posts will have these groups. Some groups will be larger and more active, but they will often have fun fall activities as Halloween alternatives that are ministry over monsters! For example, chili cook-offs or trunk or treats with themed costumes often from the Bible. 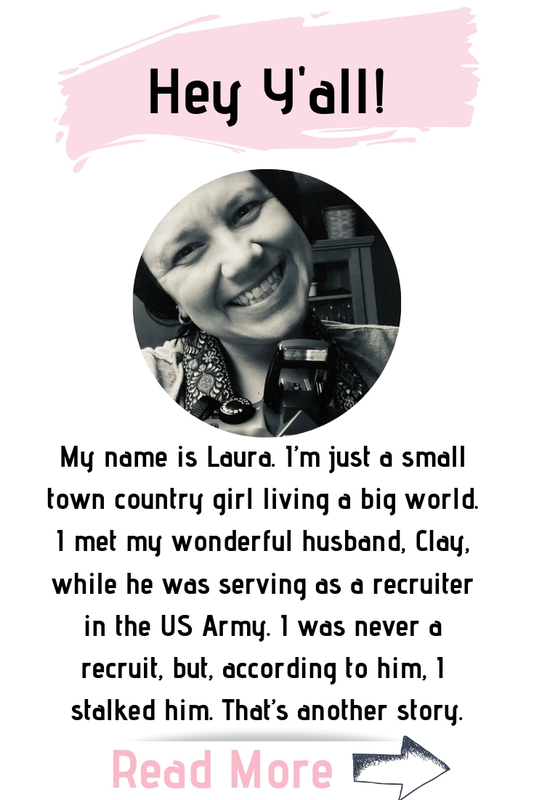 Plus, PWOC or CWOC are great ways to find real fellowship among the military wives in your area. Whether you live on or off post, as an active-duty spouse, veteran, or spouse of a retired service member, you are invited to these groups. I have found no better sisterhood than in the PWOC groups I’ve had the opportunity to experience. 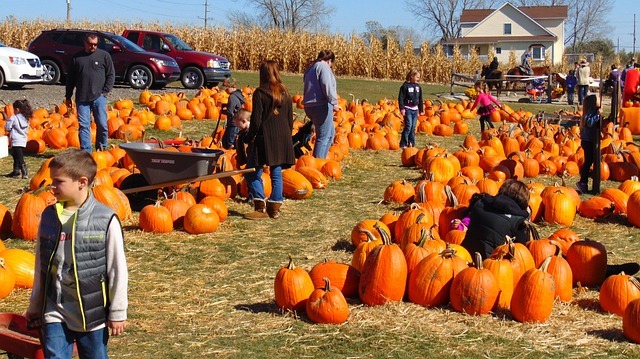 Find the great pumpkin patches by asking locals where they go and why. Lots of pumpkin patches pop up this time of year, but finding one that is just right for your family can take some research. Are you just looking for a great pumpkin? Sometimes, you’ll find the best ones at a local grocery store. But if you want to spend a day wandering through a corn maze, picking out pumpkins in a field, taking a hayride, and sipping on cider, you’ll have to do some research. But sometimes, taking a risk and having a family adventure is half the fun. Many local churches will host Fall Festivals or Trunk or Treat gatherings, which is a great way to spend time together in fellowship with your family, church body, and local community. Some will even have a gospel or Old Testament costume theme. If you pass out candy, you can always add a label with a verse or an invitation to church. 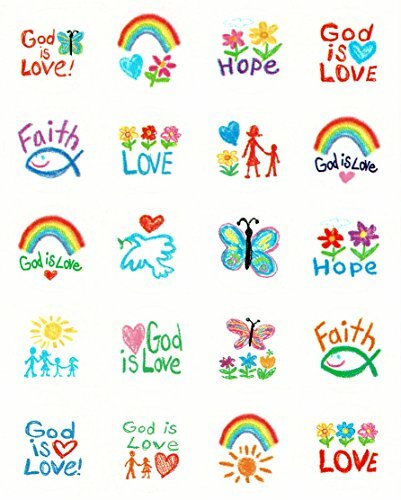 Even a faith-based sticker on the wrapper might remind them your church family is invested in its community. Bookmarks are another great handout item. 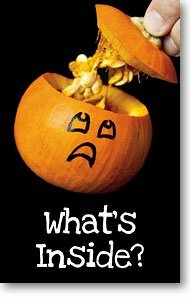 If you really want to share the gospel, Amazon has some cute Pumpkin Gospel and Trick or Treat pamphlets. Depending on where you live, you will have different regional opportunities, but it’s harvest season no matter where you are. Find a local orchard and see what events are available this time of year. Kids love picking their own fruit for a pie. My daughter loves to make our own applesauce. Learning how cider is made is another fun and educational opportunity some apple and pear orchards offer. Petting zoos, hikes, hayrides, and hot air balloons are also common fall activities. For example, the Rock Ranch in the Atlanta area, founded by S. Truett Cathy founder of Chick Fil-A, was the family ranch but became a place for children and families to gather all season long at various events including hayrides and a hot air balloon glow. Fall is perfect for enjoying family time with all the long weekends and holidays: Columbus Day, Veteran’s Day, and Fall break. Take advantage of these fantastic opportunities to explore the season. 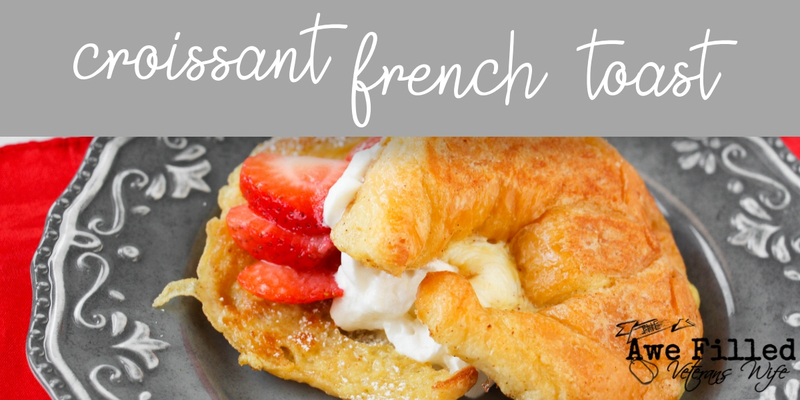 All the family friendly fall activities waiting for your family just might surprise you! Previous Post: « Is the Best Option for your Military Family Homeschool?